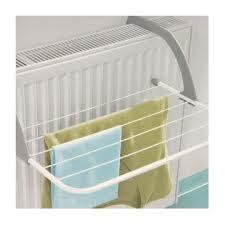 The Radiator Airer With 5 Adjustable For Drying Clothes can hook onto a central heaAting radiator. Is it difficult for you to peg clothes onto a clothes line? Your balance is not very good and you feel happier using a Radiator Airer With 5 Adjustable Arms For Drying Clothes.A Does this sound familiar? Any clothes line at or above head height is not easy to use. Now it is difficult to keep your balance and fear of falling over. You do not have a garden or an outside clothes line. The problem is that you are a wheelchair user and cannot reach the clothes line. One of the main advantages of a Radiator Airer For Drying Clothes would be for a wheelchair user or for someone who needs to sit down to put the clothes to dry on the line. The bars will give you extra drying space that you may well need. It must be used indoors The adjustable arms make it very easy to fold down and store when it is not in use. If you don’t have much room for drying stuff I would recommend this Airer. Buy a Radiator Airer With 5 Adjustable Arms For Drying Clothes now.